In the aftermath of an accusatory email that made its way around town highlighting the rogue business practices sent by an ex-chef, many wondered how long Dakota Prime would last. As a result of the unwelcome press and the constant rotation of kitchen and floor staff, Dakota Prime was headed for seriously murky waters, with a broken sail and a mutinous crew. But that was the fall, and this is the rise. To be fair, we’ve always liked Dakota Prime. The food wasn’t fussy, it had a series of talented chefs, and the meat was cooked just as it should. Their wine list was full of impressive vintages and their ingredients carried pedigrees from notable farms. 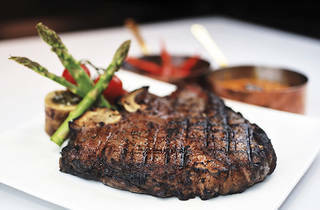 We received the news of their renaming to Opus Grill with welcome relief. 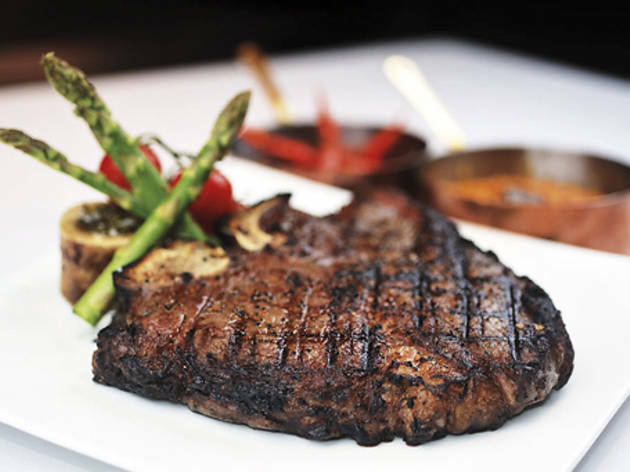 Now, if Dakota Prime was the anti-steak house, then Opus Grill is the anti-anti-steakhouse, which is to say, it is a traditional meat and starch kind of place. Gone are the nouveau items, instead a classic steakhouse menu remains. From Bryan Flannery’s California Private Reserve, we chose the hormone-free short ribs ($320 for 12 oz). However, short ribs cooked on a grill are a waste of time. They came out overly chewy. Short ribs, in our opinion, need to be braised to achieve fork-tenderness and praise. The flat iron is traditionally one of the cheaper cuts. Here, David Blackmore’s Grade 9 flat iron had enough fat marbling to make this one worth comparing with other prestigious cuts. This should be ordered without a second thought. But beware that at $410 for 10oz it doesn’t come cheap. We ordered ours medium rare, but one cut down its centre told us this steak was black and blue: blackened on the crust, with a pulsating fleshy centre. Every chew had so much flavour, and was worth $41 a bite. The grilled sweet corn stew ($40) was a sauté of fresh-cut corn and red peppers with lots of butter ($40). If only our server didn’t make such a big deal about how the sweet corn was cut fresh, we wouldn’t have made a big deal of telling you how not very sweet it was. The spinach and ricotta with béchamel sauce ($80) is a winner. Do order this. And finally on to the dénouement: the pudding. It is difficult to find fault with a warm chocolate cake ($100) with a hot fudge centre, and we found none forthcoming. The whole thing was polished despite repeated moans of how we were full to bursting. You’ll notice right away that they have done very little to the décor apart from a new wall treatment. Everything else was leftover from the old venue, which we think might hurt them as there is very little distinction from their former self. But maybe that is the point. You can reinvent yourself, but the past is never truly lost. All the good parts of the former Dakota are all here: the good wines, the premiere steaks, and the gaggle of well-wishers as you enter and leave. And like its wines and steaks, this place just gets better with age. 7/F, LKF Tower, 33 Wyndham St, Central, 2526 2366. Daily noon-2.30pm, 6.30pm-10.30pm. Meal for two: $1,500.